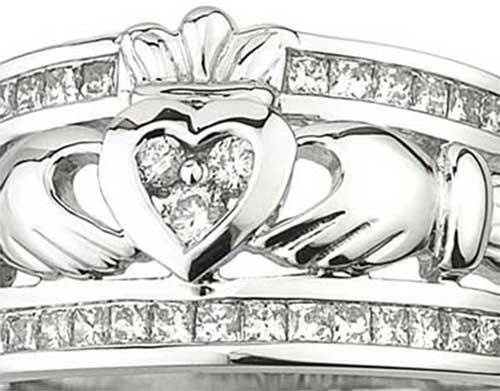 Diamond Claddagh rings are offered in both white gold and in yellow gold; we also feature combinations of various precious metals. 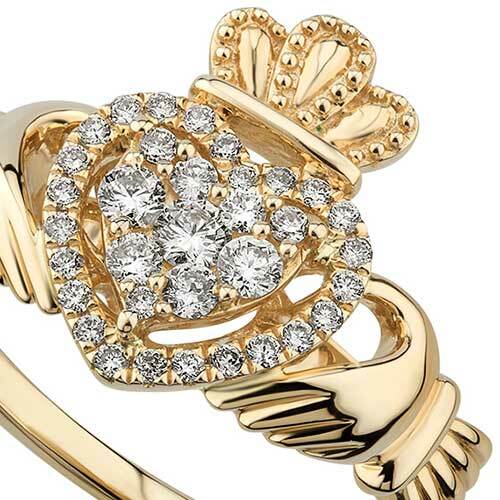 Many of our diamond Claddagh rings feature the precious stones as the hearts while some also have diamond accents. 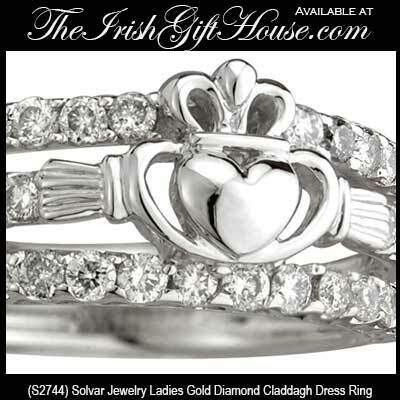 These Claddagh rings with diamonds are available as dress style designs and as eternity rings. Not only do these gold bands look beautiful, but every Irish woman will be proud to display her Irish heritage on her finger. 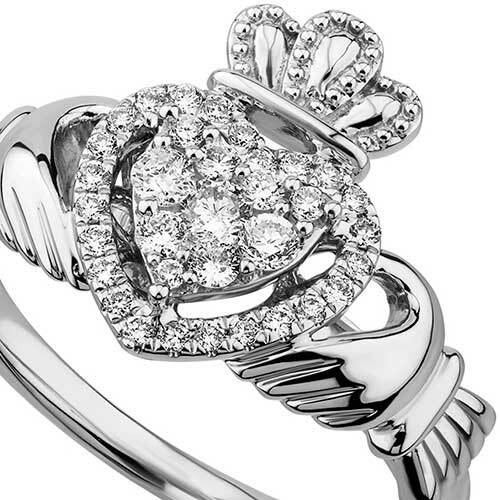 Like all our Claddagh rings, these diamond designs from The Irish Gift House are made in Ireland and are hallmarked by the Irish Assay Office at Dublin Castle. 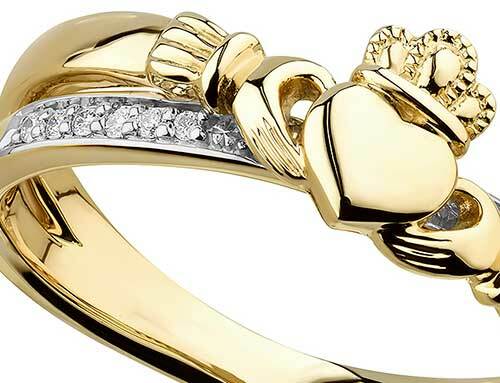 The hallmarking identifies the gold caret weight and proves that your ring was truly made in Ireland. 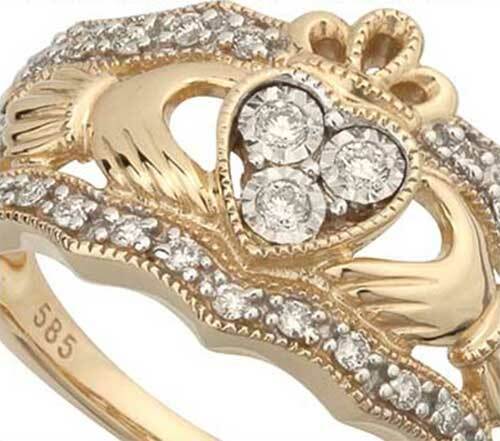 Diamond Claddagh ring features a 14K gold design with over 1/3 carat diamonds along with a large face. 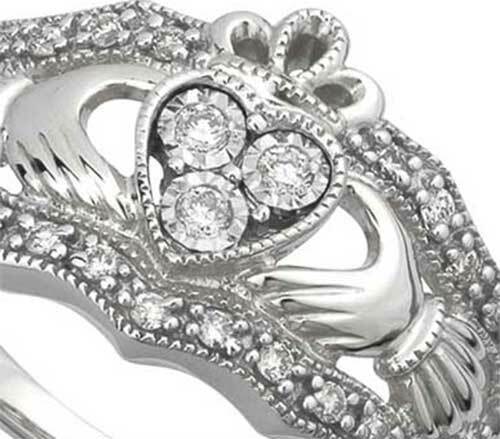 Diamond Claddagh ring features a large 14K white gold design with over 1/3 carat diamonds. 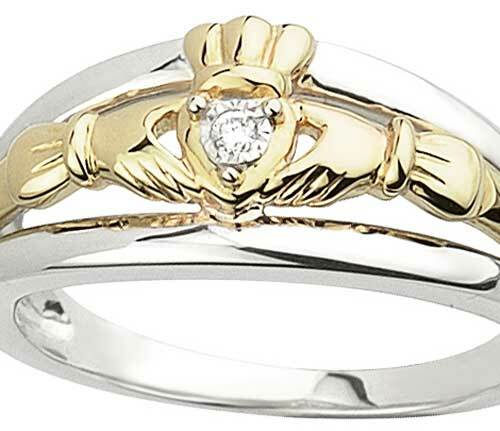 Gold Claddagh ring features a 14K crossover design that is accented with diamonds in the white gold field. 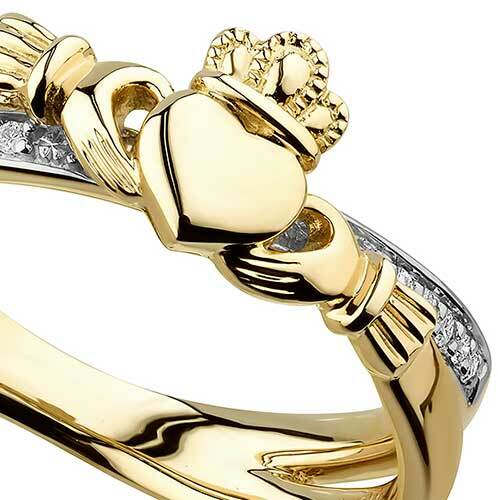 Gold Claddagh ring is cast in 14K; it is accented with diamonds in the cuffs and crown along with the open heart. You obviously appreciate a beautiful stone in your Irish ring or you might not have visited this page on our site. 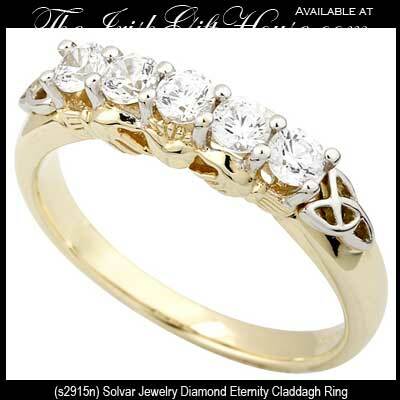 If a diamond is your fancy, please take a look at our Claddagh engagement rings for additional options; you may also wish to browse our emerald Claddagh rings, after all, Ireland is the emerald Isle! 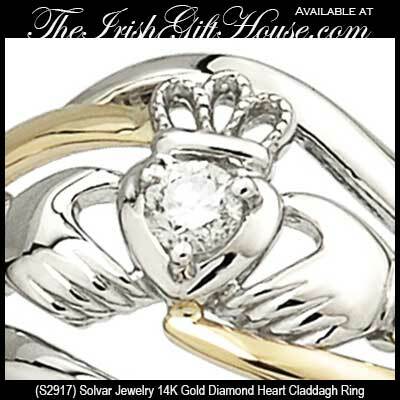 Once you select your Irish ring you may want complimenting pieces and The Irish Gift House has you covered. Diamonds or emeralds are featured on many of our gold Claddagh earrings and gold Claddagh necklaces. 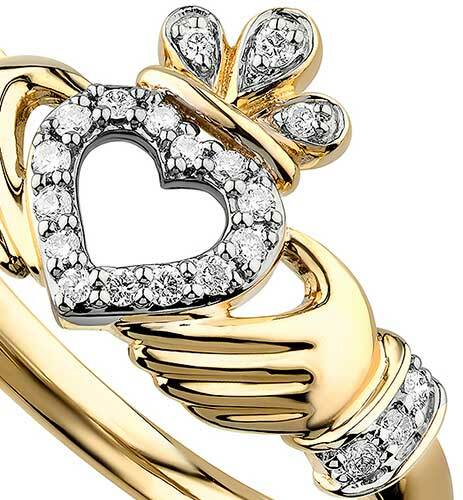 The diamonds and emerald (and on some pieces both) are set as either accents or the heart is set with the stones; either way, you may be impressed with our collection. 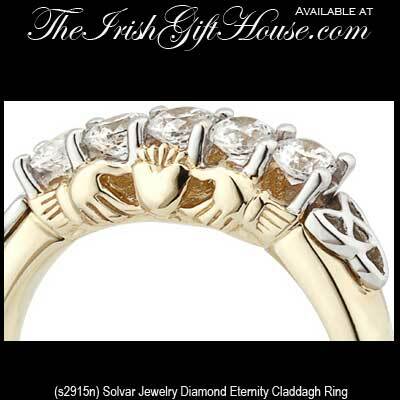 This assortment of diamond Claddagh rings is made in Ireland by Solvar Jewelry.